Club Penguin Cheats by Mimo777 Club Penguin Cheats by Mimo777: Club Penguin Community Tree Is HUMONGOUS! OMG! I think that ventually a door will apear and it will be on a new room based on elves!!! Now that is big. I think it will grow higher, that we cant see the top of it on our screen. Then CP will make it into a tree house. It is!?!? :D HAPPY B-DAY! What a great day for it to be your B-day, ya know? New CP updates! Awesome,have fun on ya bday! Happy Birthday! Have a great day with all the new things! happry bday!my bdays saterday!what did you get? probly because that thing wont stop! when are the new cpg mod changes? P.S. Elf catalog and furniture! Now THAT would be awesome. The dojo starts, then the fire dojo. Notice when you go to the Dojo Courtyard, how there is a valcano, a waterfall, and a mountain. Valcano = Fire Dojo, Waterfall = Water Dojo, and Mountain = Snow Dojo! Is it me or does that sound right because there is already a fire dojo, and its the valacano!? I think that it will get so big and dangerous that it will have to be cut down in a field op! That would look cool. Too bad they didn't put faery lights on it for the fair. OMG! I think that ventually a door will appear and it will be on a new room based on elves!!! You already can't see the top of it on your screen. But the tree house bit sounds cool. I dunno. Soon I hope. NO WAY. My birthday is in like a week! :D That's awesome, happy bday. Whoah. See I'm telling you! My birthday is next week... Wednesday to be exact. :D Funny. I still need help to get the 5000 shoot the tube stamp on catching waves? I've been trying on freestyle, but I'm always running out of time. Cool! I think that someday.... IT'LL BE A TREE HOUSE!Ya know! Like when the Forest had tree houses in it! Ps- NICE SITE!!! HEY ITS YOUR BIRTHDAY TODAY! HAPPY BIRTHDAY! Its probally going to grow that big, its going to be a room of some sort up there, i think. Woah, that, is one big tree. This is gingerthedog2007. Remember me? I won the Mimo Song Contest. When you get time, will you contact me through my YouTube account about the private party? Thanks. DUDE BIG FAN! also how ya put your website on google I NEED HELP DUDE! Plus awesome posts I'll see wat your gonna play. That dinosaur thingy. ANYWAY THX FOR THE HELP! Please look at my comments Mimo, please. Mimo reads and posts every comment unless there is something inapropriate in it. Mimo hasn't done them in awhile so I would think that the next changes would be soon. Press the Print screen button in the top right corner and then go to the program paint on your computer (It should be already on your computer in accessories) and click edit and paste. Then you can move the picture around until you have it the way you like and then size the frame you want. CP is trying to "Go green" and I doubt that they will cut it down. Even though it's late, Happy Birthday! XD I hope that happens! It would be so awesome! And when you go in it you morphe into an elf. 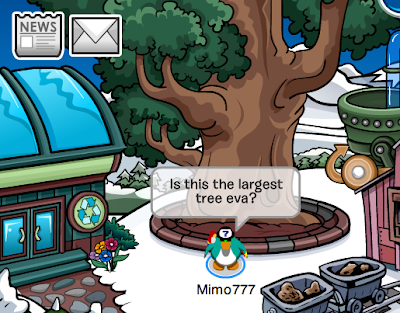 I think however much you recycle in CP determines how big the tree gets! Yeah, he bought it from the game " Club Penguin Game Day "
*Swallows a watermelon seed* burrb, what?! I'll recommend that to my fans when I get them. I hope i will! U THE BEST MAN!! !